Norwich XI: Ruddy; Wisdom, Bennett, Bassong, Olsson; Tettey, O'Neil; Howson, Hoolahan, Brady; Jerome. Swansea XI: Fabianski; Naughton, Fernandez, Williams, Taylor; Ki, Shelvey; Montero, Sigurdsson, Ayew; Gomis. That's all from me. Join Tom Rostance and Shamoon Hafez in the main Saturday football live for all the reaction to this match and others. All over. Norwich have their first win in seven matches, and their third of the season. Ayew's shot is deflected behind for a corner, but it's headed clear by Mbokani. Five added minutes for Norwich to hold out. Gomis, for the umpteenth time today, concedes possession. He has looked a shadow of the lethal striker who tormented defences in August. Jonjo Shelvey, another who has had a disappointing day for Swansea, is hooked, and Eder comes on for his 10th sub appearance of the season. Bafetimbi Gomis, who has had a woeful day, sends a shot over from 30 yards. He looks very short on confidence. Midfielder Leon Britton comes on for Swansea, Gylfi Sigurdsson the man replaced. Norwich all over Swansea like a cheap suit now. Wes Hoolahan lets fly from 25 yards - it was probably rising just over, but Lukasz Fabianski makes sure with a fingertip save. A nice little exchange between Jonny Howson and Robbie Brady ends with the latter sending a venomous shot wide from a narrow angle. "Poor marking from Swansea, as a looping corner round the back is headed back into the six-yard box. Howson was there unmarked. Poor, poor defending from the Swans." I told you it was coming to life! Norwich take the lead, and they probably deserve it. The corner comes in from the right, new man Dieumerci Mbokani heads it down and Jonny Howson is there to tap in from close range. The game is just beginning to warm up a fraction. Gary O' Neil sends a half-volley just wide, and then Robbie Brady stings the palms of Fabianski with a rising drive from 20 yards. A first change for the hosts - Cameron Jerome is off and Dieumerci Mbokani is on. Decent try from Ki, who curls one just over from 20 yards. Much better from Swansea. That's by far the closest Swansea have come. Bafetimbi Gomis holds the ball up well and releases Wayne Routledge in acres of room on the right. His cross finds Gylfi Sigurdsson, whose clever flick-scoop attempt bounces off the top of the bar. Jefferson Montero has had a very quiet game and Swansea boss Garry Monk has seen enough. He's off, and on trots Wayne Routledge. That's a nasty one for Jonjo Shelvey, who is caught by Gary O'Neil's studs on the top of his thigh, and then Andre Ayew gets a bang in the face. They'll both be OK though. Bafetimbi Gomis has looked completely toothless so far. He hasn't scored in his last seven league games, and it shows. He is being bullied by Norwich's centre-backs, who haven't let him win anything in the air. There are moments in this match that are almost impressive by Norwich, especially considering that they've lost their last four. They break upfield nicely and Wes Hoolahan has the chance to play in Robbie Brady, but the final ball is poor. Again. Huge credit to the Norwich supporters, they're still making a big racket despite the less than scintillating fare on display. There's a roar of approval as Martin Olsson gallops into a promising position on the left, but his low cross is cut out. Sebastien Bassong charges forward on a kamikaze sortie from centre-back, gives the ball away, and is very lucky that the ref blows for a foul. Jonjo Shelvey then fails to pick out Gomis with a through ball. Wes Hoolahan clips a cross straight out of play for a goalkick. Aargh! Sigurdsson sends in a curling free kick from the left, but it's too high and it drifts out for a goalkick. Dear oh dear. Sebastien Bassong, under no pressure, gets himself into a horrible tangle, panics, and frantically boots the ball out for a throw-in. Help me. Wes Hoolahan plays a nice ball to release Jonny Howson down the right, and his cross drops beautifully onto the head of Robbie Brady. It's a decent header, but Lukasz Fabianski gets across well and clutches it. We're back under way. No changes in personnel, but let's hope for a change in quality, shall we? This graphic just about sums the first half up. Swansea absolutely dominated possession, with more than three-quarters of the ball, but their play was concentrated in the centre of the park - they couldn't keep hold of it in Norwich's third of the pitch. In fact, Alex Neil's side actually saw more of the ball in dangerous areas, and they arguably posed the bigger goal threat. I almost dozed off. A dreadful half of football, with no real chances and precious little quality on show. Still, it can only get better I guess. It's been a frustrating half for goal-shy Swans striker Bafetimbi Gomis. He tumbles in the penalty area under the challenge of Sebastien Bassong but the ref tells him to get to his feet, then, to add insult to injury, John Ruddy foxes him with a dragback. And that's why Lukasz Fabianski got that 'Flappyhands-ski' nickname. Gary O'Neil whips in an inswinging corner from the left and it very nearly embarrasses the Polish goalkeeper, who eventually manages to grab onto the ball at the third attempt. Neil Taylor gallops into space on the left, but under no pressure, he sends his cross sailing over the expectant heads in the penalty area and out of play. Story of the match so far. Swansea have had a whopping 75% of the possession so far, but they've done very little with it. Just two attempts for the visitors, neither of them on target. You wouldn't think Swansea were the away team. Ki Sung-yueng, playing at the base of midfield, is being given all the time in the world to get his head up and pick his passes. But so far Swansea's neat passing hasn't looked like cutting Norwich open - John Ruddy hasn't even had to get his pink socks dirty. Swansea are passing it around nicely, as is their wont, but it's not getting them anywhere at the moment. Again they cough up possession cheaply on the edge of the area. That's selfish from Wes Hoolahan - Jonjo Shelvey gives the ball away in a dangerous position, but Hoolahan doesn't play the pass to Cameron Jerome until much too late and the chance is gone. Damian Humphrey: Is it me or is this game a must win for Norwich? Jonny Howson is causing all sorts of problems with his whipped free-kick delivery. Another pearler comes in from the left and Lukasz Fabianski just about manages to punch it to safety under pressure from Sebastien Bassong. John Ruddy is wearing an absolutely atrocious goalkeeping kit today. Slate grey, with hot pink socks and collar. Probably not the one to buy your kids for Christmas. Swansea are being allowed a lot of time on the ball, even 10 yards inside Norwich's half. The visitors are stroking it around very comfortably at the moment, although Bafetimbi Gomis concedes possession cheaply with an overhit pass. Gorgeous interplay down the left from Swansea releases Jefferson Montero - his cross threatens to cause problems, but in fact it's just curled out of play. Howson lets fly from 25 yards when Federico Fernandez's clearing header falls to him - it's well struck, but Lukasz Fabianski is easily behind it. Much better five minutes from Norwich though. That's better from Norwich, who create the clearest chance so far. It's a good free kick, whipped in from the left by Jonny Howson, and Cameron Jerome does brilliantly to escape his marker but can't keep his header down. "I don't think Garry Monk is under pressure - he has been doing a fantastic job. He goes again today, and it'll be difficult at Carrow Road where Norwich are fighting for their survival. "Any pressure Monk is feeling is as a result of doing so well in recent times." Norwich have the opportunity to counter when Swansea over-commit at the subsequent corner, but Robbie Brady can't release Cameron Jerome, who was screaming for it. Norwich are struggling to keep hold of the ball in these early exchanges, and when they do finally get some possession, Robbie Brady gives it away with a terrible pass. Jefferson Montero then skins Andre Wisdom to get to the byline, where his cross is turned behind. All Swansea so far. Some nice, neat passing from Swansea before Ki Sung-yueng releases Andre Ayew down the inside right with a lovely through ball. However, his attempted cutback is cleared by Sebastien Bassong. Anything you can do, I can do, well, even worse. Bafetimbi Gomis sees Wes Hoolahan's awful attempted lob from 40 yards and raises him a dreadful shanked volley from 30 yards out. It can only get better, I suppose. "This is a massive game. The players will know that, the atmosphere will be big there and both managers will be feeling the pressure. "Norwich, as a club, need to remain calm and not panic. Yes they have lost a few games, but what did they expect having just come up?" Good lord. After only 10 seconds, Wes Hoolahan launches an, ahem, optimistic effort from 40 yards that sails high and wide. After an impeccably observed minute's silence, away we go. 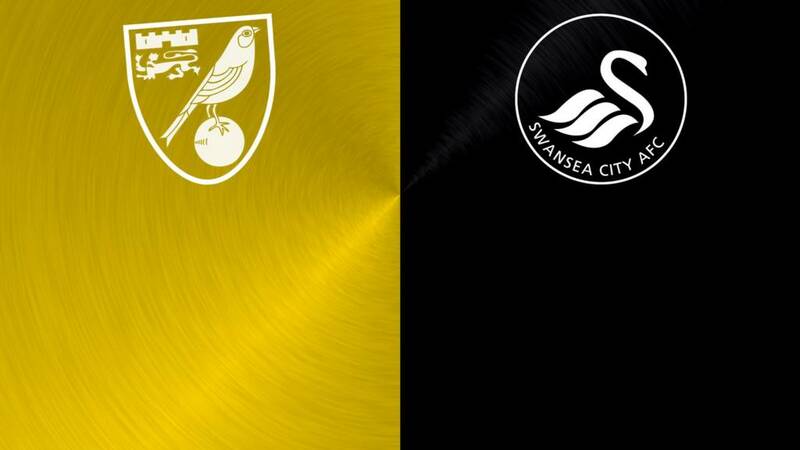 Norwich is yellow and green, Swansea in all white. The home side, kicking from left to right, get us going. Another concern for the away side is the form of striker Bafetimbi Gomis, who has failed to score in his last seven matches. Ahead of this game, he's had this to say on Instagram: "There are some times more difficult than others. However it's at this moment that we have to stay close and work harder than never. "All together with our loyal supporters nothing is impossible and we will find the success!" What's happened to Swansea? For the first few weeks of the season, they looked like one of the most dangerous teams in the league - with the wing wizardry of Jefferson Montero and Andre Ayew causing opponents particular problems. Ayew in particular was sensational, banging in three goals in August and being widely hailed as the signing of the season. We all know how important it is for newly promoted sides to pick up points at home, but Carrow Road has been anything but a fortress for Norwich of late. Alex Neil's side have won only one of their last eight matches at home - and lost six. They'll need to turn that around pronto if they're to avoid the drop. Is today the day they start? Norwich make three changes from the side that lost 2-1 to Manchester City - Russell Martin, Youssouf Mulumbu and Matt Jarvis drop out, and Andre Wisdom, Wes Hoolahan and Gary O'Neil come in. Swansea are unchanged from the side that lost 3-0 to Arsenal. Can you pick a winner? Things may not be going too well for Swansea and Norwich in the actual league table, but both clubs are flying high in the BBC Sport Predictor leaderboard. Swansea's fans are 4th, while Norwich supporters are 7th. Reckon you can pick a winner in this one? Have a go with our BBC Sport Predictor game. It's been a season of mixed fortunes so far for the Swans and the Canaries. After flying starts, they're both in danger of heading south for the winter. Norwich have lost their last four to drop to 16th, while Swansea have only won one of their last seven - causing them to plummet from 4th to 13th. Can one of these sides pick up a much-needed victory today?